Door hinges last for a long time and usually don’t need to be replaced. However, some folks like to change them out for a new color or finish when updating a room. Occasionally, the hinges will be so covered in layers of paint, it will be hard to see not only the outline of the hinges, but the screw heads as well. You can probably guesstimate where the screw heads will be. I usually take a screwdriver and press down and the screwdriver finds the head. I guess it depends on whether or not you are keeping the hinges or replacing them. You could use a razor or even a standard screwdriver and scrape off some paint around where you think the screw heads will be. If you are keeping the hinges, you have a headache of removing all the paint on them. In some cases, the paint will peel off easily but it is tough to get all of it out. I suppose you could use fine steel wool to remove the last traces of paint, but really, just go get some new ones and save yourself he trouble and time of removing decades-old paint. 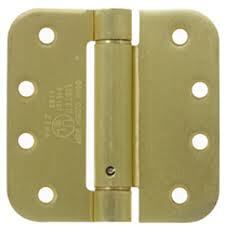 Replace one hinge at a time so that you don’t have to remove the door, which would also add time and headaches. If you are painting the door, obviously paint it first, and then replace the hinges. 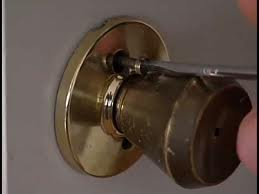 How do you Tighten a Door Knob When there are No Screws? A loose door knob is an easy repair right? It really only takes a minute and a screwdriver and it is tight again and working normally. But what if you can't see the screws? Some people get a little confused though when they can’t find the screws. The screws hold the two halves of the handle together. They mount on either side of the door and sandwich the latch mechanism between them. Turn the handle and it operates the latch. Over time though the handle will get loose and it’s time to tighten the screws that hold the two halves together. The screws will always be on the interior side of the door. If they are not visible, look to where the handle meets the door. This will be a decorative cover that hides the screw heads. You should be able to pry off the cover with a screwdriver. You might notice that the cover will have a small cut-out in it. This is so you can rotate the cover and expose the screw heads. The cut-out will allow you to insert a screwdriver and tighten the screws (there will be two). When the handle is tight again, rotate the cover back and snap it back down. A door latch takes a lot of abuse and occasionally needs some easy maintenance. There are times when a door latch will get so gummed up with dirt and the parts get worn that it is very difficult to get it to move in-and-out like it should. Instead, it will hit the door strike plate and just stop. The noise is loud and the door doesn’t latch. 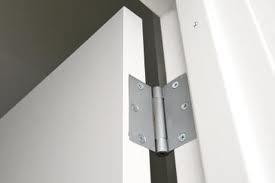 If the tolerance between the door and the jamb is extremely close, the latch may hit on a flat part near the door (instead of the angled latch) and fail to engage. For this you can remove the strike plate, slightly mortise it, and reinstall it. For the most part though, a simple cleaning and lubricating will do the trick. Remove the handles so that the latch mechanism is exposed. You can use a spray lubricant on the mechanism. Spray it on and wipe off any dust and grime from the mechanism. Move the latch in and out to work the parts. You can also push the latch in and spray into the surrounding area. You can use a rag to wipe off the parts, and when the rag comes out clean, give them a final shot of lubricant. Reassemble everything and the latch and knob should work much better. Hollow core doors are light weight, but are easy to damage. 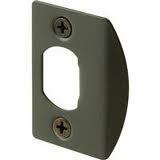 Door hinges can become loose in hollow core doors fairly easily. Remember, a hollow core door has solid wood only around the perimeter of the door and at the handle area. If you have a loose hinge, obviously try tightening it slightly with a screwdriver. You may be done at this point. If the screw just turns and doesn't tighten the hinge, the hole is probably reamed out and there isn't enough wood for the screw threads to bite into. For this you can try a larger screw with more aggressive threads. If this fails, fill in the hole with a golf tee and use adhesive to glue it in place. Once it has dried, you can pre-drill a hole and reinstall the original screw (if it is in good shape). You may have to do this at more than one screw location. If the hinge is loose at the jamb, you have more options. Certainly you can use the golf tee trick, but you can also use a longer screw. A longer screw at the jamb will eventually reach the framing behind the jamb, whereas where the hinge meets the door, there is only empty space with a cardboard-like material because it is hollow. Security doors that are installed correctly do a great job of preventing break-ins. Even if they are rock solid though, doesn’t mean some idiot won’t try to get in. A friend of mine told me that someone tried to get into his house by trying to open the security door at the front of his house. He first tried to pry the door open, but when that didn’t work, he tried to pry up the metal mesh behind the door. He was able to somehow pry or kick a portion of the mesh away from the frame, but still wasn’t able to get by. The bad guy eventually gave up and left. The mesh served a good purpose, another roadblock to entry. At this point, my friend could have either replaced the entire door, or repaired or replaced the mesh. He chose to just screw the mesh back into the frame. I’m not sure how well that looked, as the mesh was bent and dented. He used self-tapping screws with pan heads which made for a quick installation. The alternative would have been to clamp the damaged area back to the frame and weld it in place. Alternatively, he could have bought new security screening and installed it, but he would have had to paint it, and at that point, why not just buy a new door? Double doors can be challenging to secure. It seems that there is always some play in the middle of the doors as there isn’t a jamb for the swinging door to latch into. So because these doors are large and don’t have a fixed jamb, they do tend to move slightly. This could also cause some movement and the weatherstrip may have gaps, so be on the lookout. Of the two doors that make up the opening, the stationary door locks into the top head jamb and the bottom threshold. With the stationary door secured, the swinging door latches into the stationary door. So the key is to get the stationary door nice and secure. On the edge of the stationary door is the astragal. Built into the astragal are sliding bolts built into either end. The top bolt slides into a hole in the head jamb, and the bottom bolt slides into a hole in the threshold. If you really ream out the holes you are going to have more play in the door. So really you want the hole to be just slightly larger than the diameter of the bolt, but not so large that the looseness allows the door to move. At worst case, you can add a barrel bolt to the top and bottom of the door to stop it from moving. Removing a door knob is certainly a beginner repair job. If you have never done it, once you have done it you will see there was nothing to be intimidated by. Door knobs sandwich the door and activate the latch mechanism. 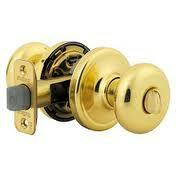 The hardware always secures the door knob from the inside of the door. There are usually 2 long machine screws on either side of the handle on the interior. If you unscrew these screws, the knobs on both sides of the door will pull away from the door. These screws are sometimes covered by a decorative cover. If yours are covered, use a screwdriver and pop the cover free. It will turn and you will need to align an opening in it with each screw, so that you can get the screwdriver in the screw head. Pull the handles apart and you will see the latch mechanism sticking through the edge of the door into the door knob hole. The latch mechanism is also held in place with two screws. The mechanism is held in place in the door’s edge. Remove these two screws and you can pull out the old latch mechanism. Now you can install a new door knob and latch. Also, you can replace the door strike plate on the door jamb. This is the curved metal piece that the door knob latch hits against as the door closes and latches. You certainly would want to replace this if you are changing the finish on the old door knob, but also if it is scuffed up, which it usually is. A fire door is a big heavy door that takes some extra elbow grease to get it to close. The door between the house into the garage is just such a door. It likely has self-closing hinges on it, that may need more tension, or the spring may have sprung. Most modern self-closing hinges have an adjustable mechanism inside that you simply turn to increase the tension and closing power. If you push down on the mechanism, it releases all tension. Use the appropriate sized allen wrench and turn the mechanism to increase the tension, which will close the door. It may be that the single hinge is not enough to close the door, and you may have to install a second hinge on the door. If so, install the hinges at the top and bottom hinge positions on the door. You want to adjust the hinges so that the door doesn’t slam closed, but that there is enough force to close and latch the door. This may take a little fine-tuning of the hinges so that you can accomplish this. The final test is this: hold the door at a 45-degree angle and let it go. It should close and latch. If it doesn’t, you can gradually adjust the hinges until it works. 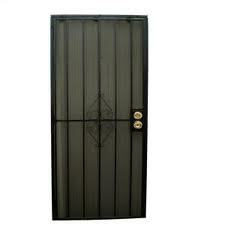 Most people think that for a sagging door, they are going to spend either a lot of time or money to repair it. There are several things you can do to fix this without having to call somebody. Open the door and lift up on it. You might see and feel a lot of play in the door. This is bad. If you can lift up the door, something is not connected well. Look at the hinges, particularly at the top of the door. It may be that the hinges have worked themselves loose either at the door or the jamb. Try tightening them up to pull the door back into the correct position. You may need to use larger screws for this if the holes have been reamed out. For hinge screws, try a larger diameter screw rather than a longer one. 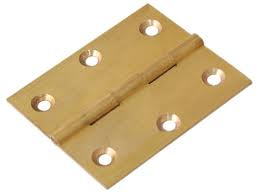 If the hinges look good, you can lift the top of the door with a long deck screw. Remove one of the top screws that hold the top hinge to the jamb (not the door). In place of the short screw you removed, install a long deck screw 3 or 4 inches in length. This screw is going to push through the door jamb and into the rough framing surrounding the door. This will pull the jamb closer to the framing and lift the door bottom up, so that it doesn’t drag on the threshold anymore. Having to push hard on your door in order to get it to latch is much more common with exterior doors than interior doors. That would be due to things like weather and weather stripping. Exterior doors have more things to get through to latch than do interior doors…things that rub together to seal out the elements…like a door sweep, threshold, and the aforementioned weather stripping. So there are a couple things you can do to try to ease the pain in your shoulder from throwing it into the door to close. You can first try to adjust the door’s strike plate so that the door doesn’t have to travel as far to latch. You would effectively be moving the strike plate away from the exterior side of the door. This might not be so easy, especially if you are only moving the plate a small amount. The screws may tend to wander back into the old holes. If this works, great…but don’t sacrifice gaps in your door weatherization so that it is easier to latch. If you can see daylight, that is a problem. You can also try to use a metal file and file away a small amount of the door strike. You can also choose to replace the weather stripping. You might try a less dense weather strip so that it compresses easier which will allow the door to close with less effort. Additionally, check the door sweep to make sure it is lightly touching the threshold instead of dragging on it.